After a work full of tiring, cold winter season, days are now getting longer and brighter. Season of relaxation, and fun, summer is getting near. Everybody is planning enjoyable and unforgettable vacations with their friends, or family, or maybe by themselves. We hope that Summer ’18 will be an unforgettable holiday season for everybody. We are here to produce your Peshtemals to save some space in your luggage. 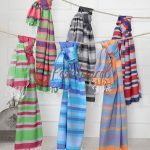 As a peshtemal manufacturer and wholesaler, we have been preparing our latest fashion, and high quality peshtemals for you and your loved ones. 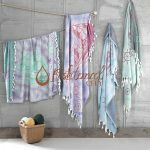 During our designing process, our first aim is to manufacture hygienic , and harmless peshtemals by using high quality raw material, and harmless paint. 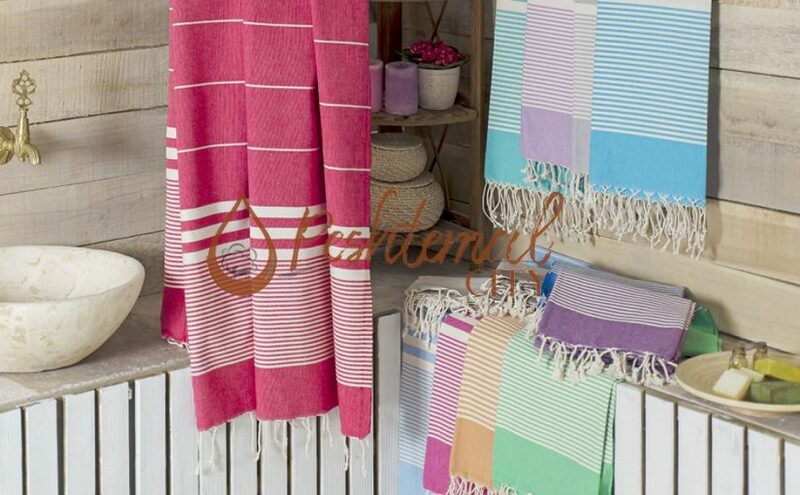 Our peshtemals can be confidently used at beaches, spas, hotels, yachts, hammams, gyms, pools and bathrooms, even for baby care. 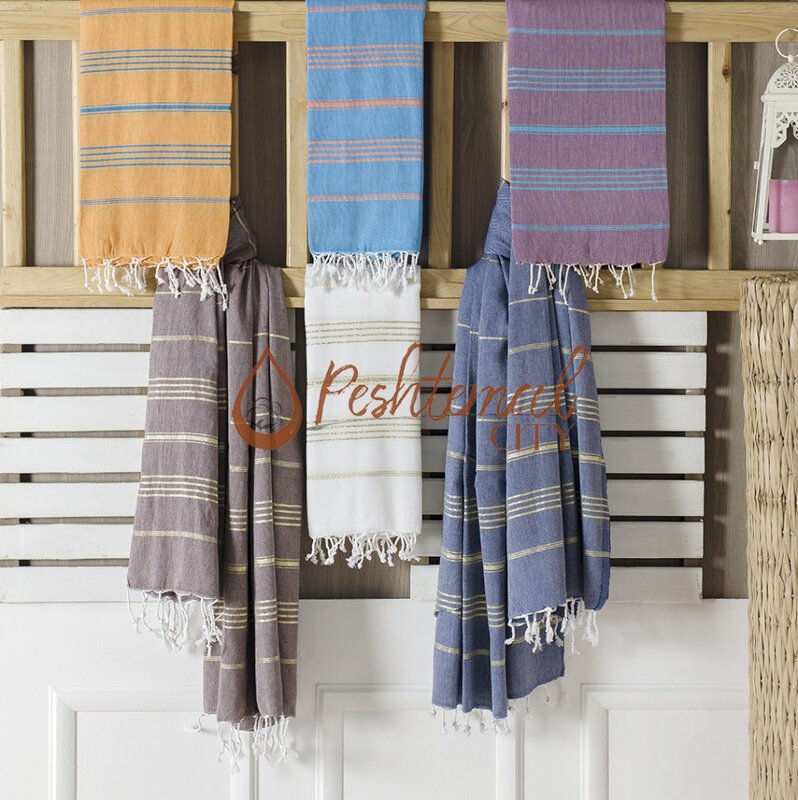 Wise Peshtemal is one of our top selling products. Woven 100% from high quality cotton, it weigths 300 grams. 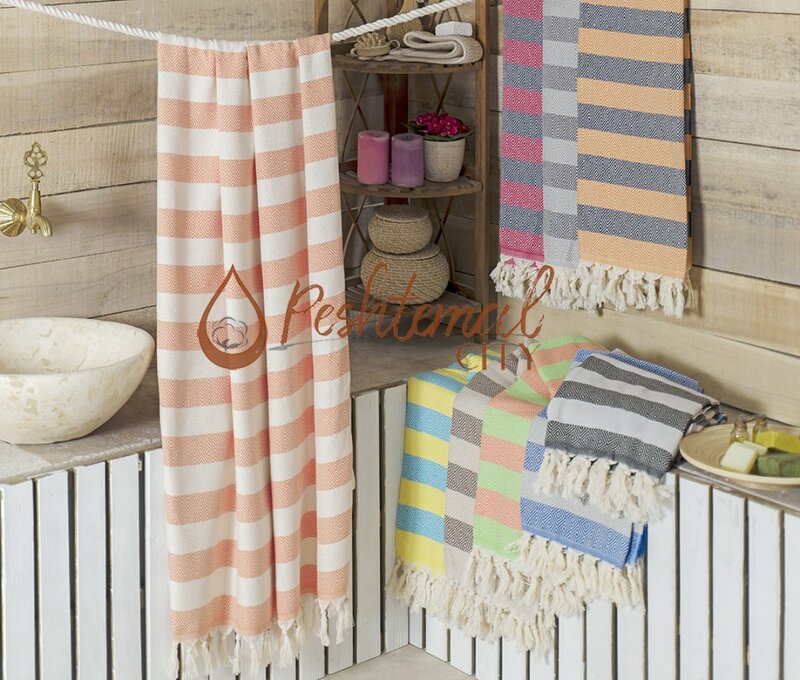 With its size of 100×180 centimeters, and weight of 300 grams, Wise Peshtemal is a light-weight, and thin hammam towel. Despite its thin texture, light weight, highly absorbent, and quick drying hammam towel. 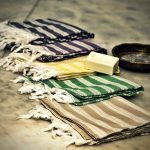 This hammam towel has wide, and single colored stripes on it. Wise Peshtemal has fringes swinging on both ends. With its stripy design, and fringes; has a traditional and elegant design. Manufactured to be sanatory, no harmful material was used during the manufacturing process of this hammam towel. 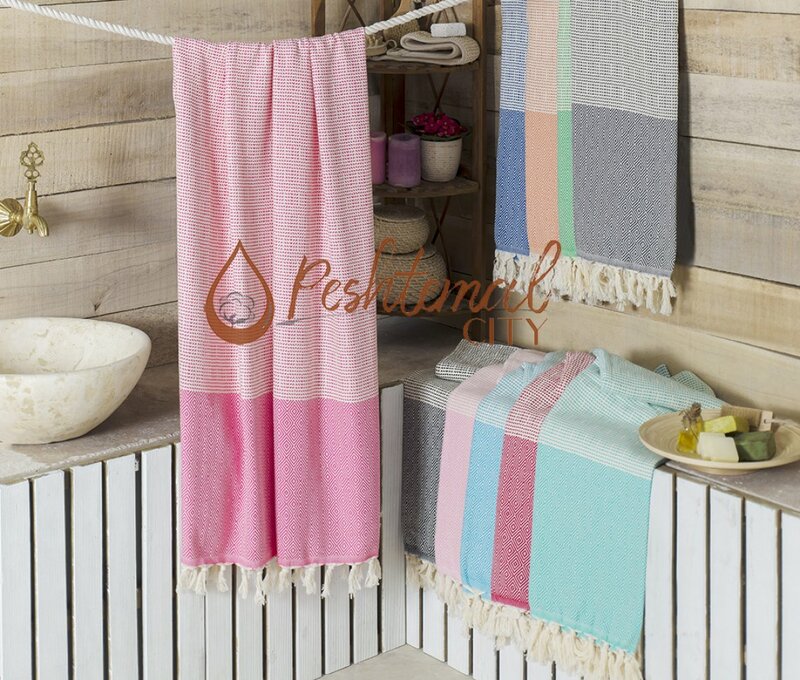 Woven 100% from high quality cotton, and dyed by the best dye house in Denizli, Rudder Peshtemal is completely sanatory, and can be used confidently at beaches, pools, spas, hammams, hotels, gyms, and in bathrooms, and also, for baby care. Rudder Peshtemal has a size of 100×180 centimeters. This fouta only weighs 430 grams. It has a thin, and light-weight texture; which makes it easy to pack, and perfect for your travels. Rudder Peshtemal is also soft; so, can be confidently used for baby care. 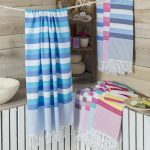 This fouta is also highly absorbent, and quick drying. Rudder Peshtemal has drawings related to the warm, and relaxing seas, and naval figures. The fringes swinging on both ends resemble the halyards on the ship, swinging due to winds that gently touch the sailors faces while they cruise on endless seas. The thematic design of this fouta makes it a perfect decorative item for yachts. While designing Candy Peshtemal, we traveled back in time, and went back to our childhood. As we dug in the happiest memories of our childhood, we remembered the pleasure of having a sweet, colorful tootsie pop. We reproduced this heartwarming memory on one of our latest fashion peshtemals, Candy Peshtemal. 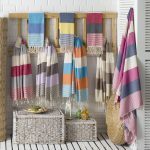 Sweet, colorful stripes, and fringes swinging on both ends, this fouta has a vibrant, and lively design. Woven 100% from ring spun cotton yarns, Candy Peshtemal weighs only 300 grams; and has a size of 100×180 centimeters. Its high absorbency, quick drying, thin, lightweight and soft texture delivers a comfortable use. 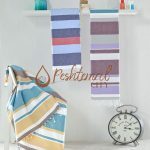 For more information about the historical and cultural aspects of peshtemals, and to discover the latest fashion, and high quality hammam towels we manufacture and wholesale keep following our frequently updated blog. Peshtemal City wishes you to have fun, and relax during Summer 2018!